» [SOLVED] Unable to read certain unicode (I assume) characters. [SOLVED] Unable to read certain unicode (I assume) characters. I am using arch in a hp omen ax250tx and have installed significant amount of fonts but still I am unable to read some unicode characters in the default config file of polybar( like the characters in line no 222,242-246,255). Can anyone suggest any font/other ways to resolve the problem? PS- If I missed giving any info please do tell me. Re: [SOLVED] Unable to read certain unicode (I assume) characters. Do you mean they're not displayed properly in your terminal? Or are they not displayed when running polybar? In any case, those characters are from siji. The answer is both. No icons are displayed when I run polybar and some are now showing (in terminal) but I doubt they are correct ( like a tshirt for wifi). I tried installing the font ( that you mentioned ) but nothing changed. What do you mean "tried"? Did you restart polybar afterwards? Edit: no idea how polybar resolves fonts, but the fontname is "Wuncon Siji"! seth: Polybar calls FcFontMatch for resolving fonts. It basically does the same as fc-match. Sorry, I didn't state things clearly. I installed siji-git from AUR and the wifi is actually ramp-signal. 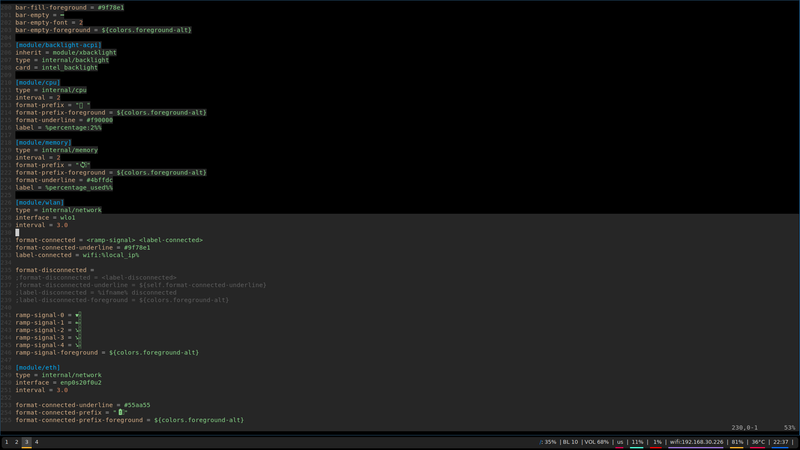 Yes, I did and also restarted i3wm. I also did what patrickziegler said but it didn't work. Are you sure that you correctly installed siji? Yes, I installed it from AUR using aurman. If the AUR package has no problem then it should be ok. It may be because of my terminal emulator(kitty). This happens for FontAwesome 5 icons also but the icons(from font awesome) are showning up in polybar without any problem. Sorry for the mistake. I will keep that in mind. Sorry, my knowledge of linux is limited. This did the trick. Note that the first of those commands may have been sufficient. If not, there is a 70-yes-bitmaps.conf provided by fontconfig. I'm not sure what 70-force-bitmaps.conf is or where it came from (it doesn't belong to a repo package), but the name is concerning - it could cause other problems if it really does force bitmap font (only) matches.